The passive system "collects the natural waves or energy that come off your body" and emits no radiation, said one Homeland Security Department official. 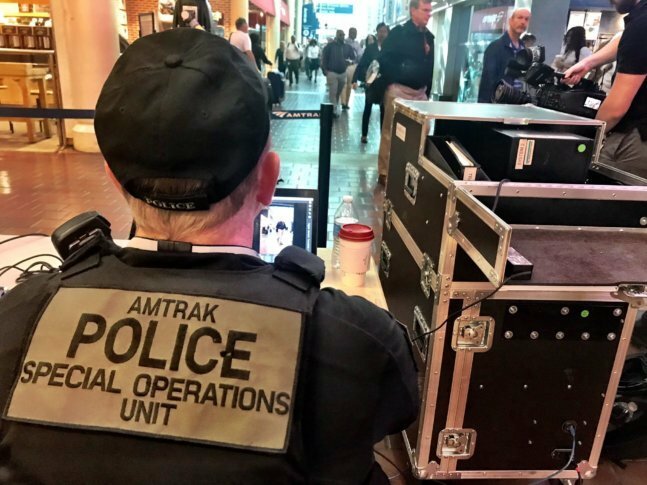 WASHINGTON — New security technology that can help detect if a would-be terrorist is wearing an explosive suicide vest was tested Wednesday morning as commuters teemed through Union Station. In a crowded corridor, passengers and shoppers walked by new portable screening equipment, which was being tested by Amtrak police, working with the Transportation Security Administration. “The technology we’re testing today would be able to tell if anything is hidden under your clothing, from a remote distance,” said Jim Bamberger, branch chief of operations in the Homeland Security Department’s risk analysis division. In December 2017, a would-be suicide bomber set off the device during New York’s rush hour, but it was not powerful enough to turn the pipe into deadly shrapnel. Wednesday morning, Amtrak police officers, viewing laptop computers, watched as passengers — including some decoys — walked through a first-floor hallway near Pret A Manger, Au Bon Pain and H&M. Bamberger said the passive system emits no radiation. “It merely collects the natural waves or energy that come off your body, and shows where that’s being blocked” by explosives or a weapon. “If I had a vest or weapon under my clothing, it would show what’s being blocked and allow me to move to secondary-screening procedures,” he said. Security is different for air travelers than for those using surface transportation modes, including trains and buses, Bamberger said. “Typical airline screening wouldn’t be practical [here], since it would slow down the movement,” he said. Mass transit, by definition, requires different security strategies, said TSA spokesperson Lisa Farbstein. “If you want to get somewhere quickly, you can’t really back people up in a queue,” Farbstein said. Homeland Security is making the devices available for testing to transit agencies, Bamberger said. “It gives an operator, like Amtrak police, the ability to test-drive the equipment in their own environment,” he said. “If they like it, they can buy it” for approximately $100,000 per unit.